...... iPods. This Media Toolkit Ultimate packs to make M4R iPhone ringtone from video/audio sources. 1.Combines DVD Ripper Platinum - helps you rip DVD to AVI, MP4, MPEG, MOV, 3GP, MP3, AAC, etc. 2.Pack Video Converter Platinum - it is one comprehensive video convertor to convert video for iPod, iPhone, PSP, Zune, Creative Zen, etc. 3.Unite iPhone Ringtone Maker - unites the function to create M4R ringtone from video/audio source. 4.Collect iPod Manager - collects the solution to backup iPod videos/audios to Computer, import your computer files or folder to iPod, even between iPhone, and between iPods. 5.Most complete HD solution - owns the most complete HD solution to convert HD video to HD video, HD video to SD video, SD video to HD video. Rip, copy and create DVD; Convert between popular videos and audios with ease. Qweas is providing links to 4Videosoft Media Toolkit Ultimate 4.1.12 as a courtesy, and makes no representations regarding 4Videosoft Media Toolkit Ultimate or any other applications or any information related thereto. Any questions, complaints or claims regarding this application 4Videosoft Media Toolkit Ultimate 4.1.12 must be directed to the appropriate software vendor. 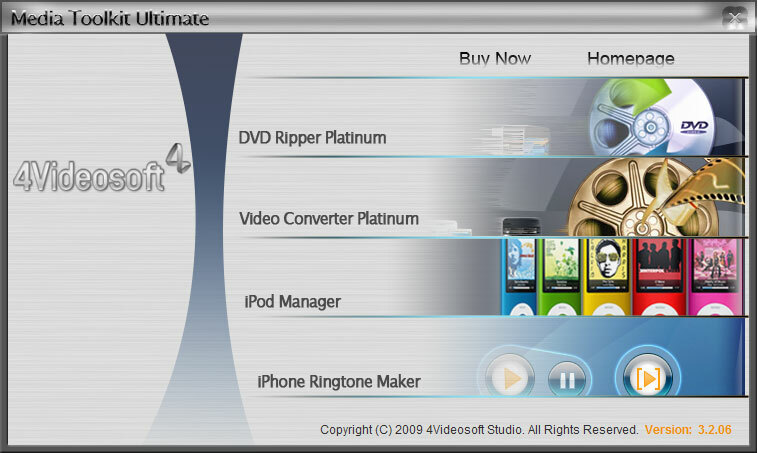 You may click the publisher link of 4Videosoft Media Toolkit Ultimate on the top of this page to get more details about the vendor.